Saint Hildegard, a 12th century German Benedictine abbess, was a mystic, composer, and philosopher who wrote works on topics as diverse as theology, botany, and medicine. She began experiencing visions at the age of three, ultimately chronicling a lifetime of such visions with theological commentary in three volumes. O orzchis Ecclesia, armis divinis praecincta, et hyacinto ornata, tu es caldemia stigmatum loifolum et urbs scienciarum. O, o tu es etiam crizanta in alto sono, et es chorzta gemma. Lingua Ignota is the earliest known constructed language. 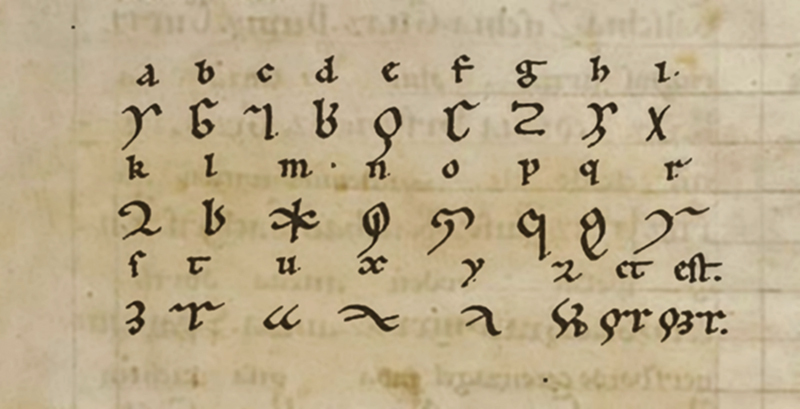 Someone made a font of Hildegard’s alphabet. This entry was posted in Uncategorized and tagged 12th Century, Books, Christianity, Germany, Hildegard of Bingen, Language, Religion, Saints, Women. Bookmark the permalink.